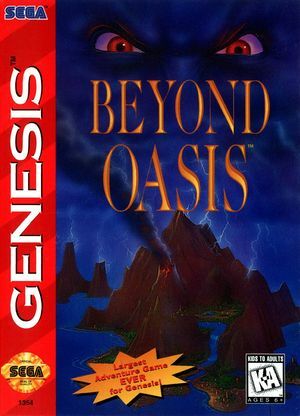 Beyond Oasis, known as The Story of Thor: Hikari wo Tsugu Mono (ストーリー オブ トア 〜光を継ぐ者) in Japan and in Europe as The Story of Thor: A Successor of The Light, on the mystical island of Oasis, Prince Ali embarks on a crusade against evil. The warrior prince must unleash the powers of the four Wild Spirits to stop the resurrection of a ruthless sorcerer and save the empire! As Ali, you can call on the powers of the four wild spirits to battle the evil minions of Agito. Fight off enemies with Ali's weapons, punches and kicks... or dig deeper to discover the Hidden Super Moves...a Sega first! Flip switches, trigger plates, and use what's left of your brain to solve mind-boggling puzzles that lead to Huge Bosses... like the Fire-breathing Red Dragon! The graph below charts the compatibility with Beyond Oasis since Dolphin's 2.0 release, listing revisions only where a compatibility change occurred. This page was last edited on 1 January 2018, at 06:10.